Graham Wroe with Councillor Jillian Creasy at Duke Street traffic lights. 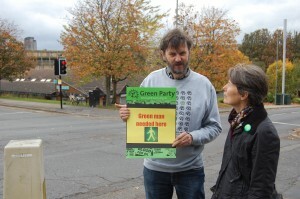 Graham Wroe presented a petition to Sheffield City Council appealing for a pelican crossing at the junction of Duke Street, Bernard Street and Talbot Street today. 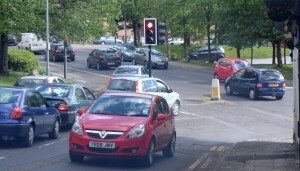 Among the 158 signatories is a woman who once fell over crossing the junction, injuring her leg. Nobody came to her assistance, but cars inched closer and closer to her until she was eventually forced to drag herself back to the pavement! Councillor Dunn responded to the petition by saying that the junction would be reassessed.